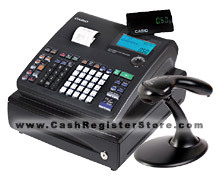 Casio TE-900 Electronic Cash Registers at Cash Register Store. The TE-900 scanning package is a low cost, compact reliable cash register. A high quality Metrologic MS-9520 laser scanner is included. The TE-900 scans up to 2000 barcodes, has a thermal receipt printer which prints item by item each product description, and a lightweight yet quality 4 bill/5 coin cash drawer. The Casio TE-900 electronic cash register features anti-microbial (anti-bacterial) keyboards. Anti-microbial keyboards are very useful. Hands and fingers are a common way of transmitting harmful bacteria and diseases and because many different people touch a cash register keyboard every day, this technology is perfect to aid in the control of reducing the spread of disease and sickness in the workplace resulting in fewer sick days. To read more about this new anti-microbial technology, click here. Being of a small footprint and low weight, the TE-900 is perfect for a kiosk or as a starter cash register. This cash register comes with a stylish black design and features a 3 line emerald LCD display, high speed thermal printer, 25 one touch department keys, 2000 plu's and a small compact cash drawer with a media slot.